intended. Entertainment, yes. Profit, no. Author’s notes: This story was written for I Made This! a time to get a bout of the runs. catch up with his companions. shape to be sprinting up hillsides. year-old grandson snuffling with a head cold. Harvey cautiously parted the branches. men…they used large knives to carve…oh, God…it was Ted. like cordwood a few feet away. The contents of Harvey’s stomach lurched toward his throat. squatted next to a clump of ferns. something moved. Something big. Something the size of two men. from its two drooling mouths. the bone like an infant at its mother’s breast. exploded behind his eyes. A second blow knocked him cold. circa 1951, she crossed from the door to Mulder’s desk. seldom-seen dimple in his cheek. squinty, before reaching for a handful of his popcorn. you.” She stood on tiptoes and grabbed for the bowl. the dust marking her slacks. He took in the stains, but didn’t lower the bowl. of popcorn and then placed the bowl in her lap. “Please tell me you do *not* suspect Bigfoot — not again. look at her, fists on his hips. “Ah.” Scully crunched another unpopped kernel. head and landed somewhere beneath a bookcase. He faced her and opened his mouth, inviting her to try again. Ghouls, and Unsolved Mysteries’ and waved it at Scully. smiled at him, charmed by his earnest expression. 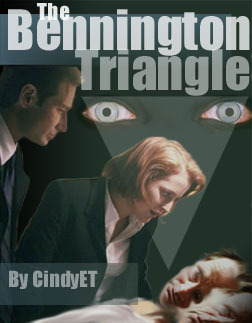 “The Bennington Beast is at the museum?” Mulder asked. holding.” She pointed a plump finger. “Your kind of place, Mulder.” Scully stood beneath the sign. smelled musty, thick with mildew and a hint of formaldehyde. Despite the cars in the lot, the museum appeared deserted. mache mountainside, its fangs bared and glass eyes sparkling. “do not touch” sign to a more prominent position. “Where did it come from?” Mulder asked. “Do you work here, sir?” Scully asked. “Agents Scully and Mulder, FBI.” She held up her ID. and the television remote in the other. to take his eyes from the television set. Scully retreated to the bathroom to finish flossing. “Hey, Scully?” Mulder called from the bed. to be heard over the TV. Yetis to Yowies’ turned to black when she closed the lid. “The Bennington Beast of Vermont?” She raised an eyebrow. creatures would be competing against modern man for resources. “But not impossible. We’ve seen something like this before. bathrobe and hung it over the rounded post of the headboard. She slid beneath the covers. “Mulder, I’m tired.” She closed her eyes. “Tell me more about stem cells,” he murmured into her ear. “How is that?” His voice was no more than a breath of air. along the length of hers. “Mulder, I don’t want the number three.” She looked at Candy. the toast and oj,” she repeated to the waitress. With a wink to Mulder, Candy headed for the kitchen. “I would guess none.” She sipped her coffee. time. It remained cattycorner and hopelessly far from the curb. larger parking space. A rusty Volvo immediately took its place. only be his identical twin brother. newcomers joined the museum owner and his twin at the car. He slid from the booth and headed for the door. “To watch the ordinary world go by,” he said over his shoulder. corner and disappeared from view. Scully came out of the diner to join him on the sidewalk. massive backpack. A fog of mosquitoes swirled around his head. “I’m Ranger Whidden, USDA Forest Service, Manchester District. She wore her long blonde hair pulled back into a thick braid. Like Rick, she was dressed for the wilderness. “Have you two done much wilderness hiking?” Rick asked. “A wide, granite outcropping about two-thirds of the way up. “Mulder?” Scully called, her voice sounding a bit desperate. the ground. It was his — she already wore her own. The trail snaked into the trees and Sheila took the lead. worked up a sweat, despite the cool, overcast morning. question after the next. The Bennington Beast. Frieda Langer. hypnotically back and forth with every step she took. “I heard it rained weenies and marshmallows in Florida once. handed him a bottle of water and warned him to stay hydrated. With a few thirsty gulps he emptied the bottle. at the four hefty packs they had carried up the mountain. Evian.” He waggled his empty water bottle. Rick accepted Sheila’s offer with a nod. He rose to his feet. away from the trees, a thickening fog whirlpooled around them. careful to steer clear of the ravine. Scully shouldered past Rick. “Let’s go.” She broke into a run. her up the stone wall to the shelf above. The ledge was empty. The mysterious men had disappeared. “Where did they go?” Scully spun, looking in all directions. stepped through the evergreen boughs. him. The snuffling died away. barrel of his gun. He rounded a massive pine. Four colorless eyes glowed in the light’s beam. quite ready to give up his search, he continued on. Six paces. There was no one. No one at all. planted firmly on the trail below, he turned to help Scully. before reaching up a hand to Rick. ground and filled the air with the smell of ozone. “Let’s hurry,” Rick said, leading the way. three tents and the tidy bivouac appeared deceptively safe. sparks and smoke into the air. “Sheila?” Rick called more loudly, his voice full of concern. “Where could she be?” Rick asked. “Sheila?” He swiveled. wiped rainwater from her chin. Her hair hung in muggy spirals. Water dripped from her nose. dry him a bit. “Fits with the legend,” he said. him and laid a palm on his shoulder. asked, knowing he would tell her anyway. “The vortex in Oregon is more than 165-feet wide, Scully. “There’s nothing more we can do tonight,” Scully said gently. shoulders slumped and he nodded. “I’ll take the first watch,” Mulder volunteered. “Sorry.” He zipped the flap behind him. into the sleeping bag beside her. He leaned close to her ear. goosebumps. She combed her fingers through his sopping hair. “In the absence of fertility treatments, about one in 700,000. They’re rare but they aren’t mutants.” She suddenly chuckled. He lay on his side, face buried in the crook of one arm. “Mulder,” she said more urgently. His eyes opened. “Get up. his face with his palms. reached for the previous day’s shirt. evergreens. No smoke rose from the sodden campfire. the narrow trail along the cliffs. The air was cool and still. “Doesn’t look any friendlier in the morning,” Mulder said. gathered over the most distant peaks. It was eerily quiet. blond braid, stained with blood, peeked out from the greenery. her cheeks. Scully glanced over her shoulder at Mulder. traveling up his spine when the branches closed behind him. stopped and aimed her gun at the base of a large pine tree. the same sound he’d heard last night. What the hell was that? sure what he was looking at. stared listlessly at nothing. It had four arms and four legs. Scully holstered her gun and knelt beside it. She ignored his warning and placed her fingers on its neck. pale, frightened eyes rolled upward beneath fluttering lids. of every trace of bone marrow. via helicopter. The S&R Team came up empty handed. search until morning –- assuming the weather cleared. lay on an autopsy table, split down the middle by Scully’s Y-incision. a rubbery snap and crossed the room to a cluttered counter. and held it up for him to see. “It’s not.” She tossed the film onto the counter. a basement window at the far end of the building. “Shall we have a look-see?” Mulder asked. not to make noise. The window was small and low to the ground. “Probable cause?” he mouthed back. front of the building with a wave of his shotgun. “Which one of you is John?” Mulder asked. “Neither,” said the man who held the Remington. insects, the catamount, the bones of the Bennington Beast. “Did you feed it Sheila Baxter’s bone marrow?” Mulder asked. into the men’s pale eyes. 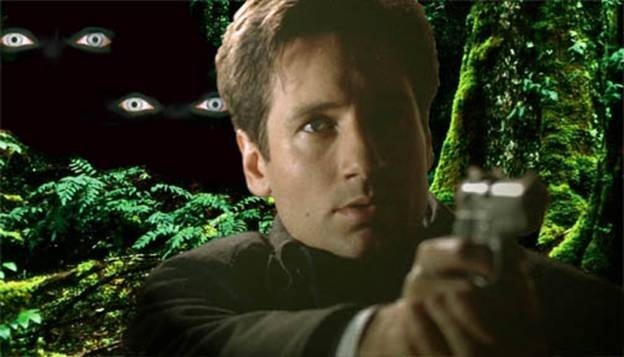 gun into Mulder’s temple, toppling him. floor and he lost consciousness. struggled and threw a left punch that caught him in the nose. “Walk…slowly,” the man said. He jabbed her once more. “I said *sit*,” Meddie repeated, his voice firm. forced her to sit. Mulder lay a few feet away, not moving. Blood trickled from his nose. “Let me go to him,” Scully said. pallor, bluish and sweaty. He began to pant. beside the prone man and stroked his arm, soothing him. lungs, unable to supply oxygenated blood to new organs. creature Scully had brought down from the mountain. hurried to the cutting table and gathered several long bones. shaped ribs. Scully knew these must be Rick Whidden’s bones. the thing’s begging mouths and it sucked the bones greedily. and fluid filled with vessels, fibrous tissue, and cells. remained locked to each other, not entirely divided. Meddie looked over his shoulder at Mulder. like a baseball bat and struck her in the neck below her ear. beneath the mud-spattered hem of his pants. pale eyes rounding with surprise. “Do it! Now!” she demanded. He let the gun clatter to the floor. She stood on shaky legs. Meddie glanced at the Browning on the stairs. slid her cell phone from her jacket pocket and dialed 911.
carried two cups of coffee, which she placed on the table. “Okeydoke,” the waitress said and headed back to the kitchen. between them and tapped the photo of the Bennington Beast. With another “okeydoke” Candy headed back to the kitchen. Candy was out of earshot. asked, and scooped a bite of egg into her mouth. any of my stories. Send comments to cindyet@tdstelme.net.